How to Keep All Your Animals Warm and Happy This Winter | Hurdle Land and Realty Inc.
Homesteading in Tennessee often means keeping some livestock. If you have chosen to keep animals on your farm, no doubt they spent their time outside. Keeping them safe through the colder months in the country is a great undertaking. It means preventing overexposure to the elements, making sure their nutritional needs are met, and just caring for their overall health and well-being. Here’s a starter guide to help you with homesteading in Tennessee this winter. Staying outside doesn’t give these animals a pass on getting a bath. Hair or fur between toes needs to be trimmed to prevent it from gathering gather ice. It is also important to keep your animals clean for their comfort. Bathing before the cold weather comes is ideal, and then regular brushing during the winter will keep your animals most comfortable. Dirt in their fur can irritate their skin, leading to scratching and possible infections. Outdoor animals need more calories as they burn more by trying to keep warm, so be sure to provide regular meals. Make sure roughage is incorporated to keep their systems moving by breaking down the grains. Plenty of fresh water is also a must, but try to stay away from metal bowls. Heated buckets can help keep water from freezing, but if you don’t have those, be sure to refresh your farm animals’ water often. Especially during severe weather, you need to make sure you have a sturdy place to stay out of the wind and wetness. Wind can be even more vicious in the winter, lowering temperatures. Consider insulting your barn to keep the warmth in. Ventilation will keep air fresh, but create it wisely so you don’t encourage drafts. And it is much safer to use hay or blankets instead of a heat source. Keep the hay fresh, so it doesn’t get wet and moldy. Or consider building platforms for animals to sleep on, since the ground can be cold. 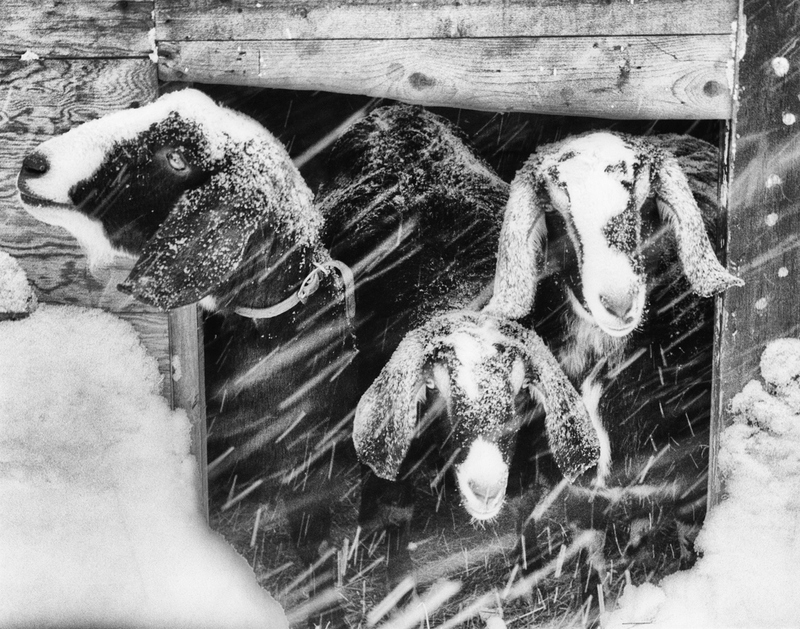 As far as blankets, some animals, like goats, might not need them. It could actually hinder the growth of their natural coat, which is nature’s way of keeping them warm. It’s hard to fight against the elements for anyone who isn’t healthy to begin with, and that goes for our four-legged friends too. Make sure all your farm animals are up to date with their vet check-ups. Beyond that, keep them moving! Exercise is good, but not as much in extreme weather. For the more temperate weather, using multiple feeding stations around your yard will encourage movement. Even when you feel you have done everything you can think of to keep your farm animals safe and happy, you still need to be on the lookout for possible accidents. Always be on your guard when turning on a vehicle. You never know if a furry creature settled in to catch some warmth by the engine. Once you have successfully cared for everyone on your farm, you can relax a little more and get ready to enjoy the season the country.